I always struggle with good ideas for gifts. Our 25th is coming up and I'd like to great her something special. Do any of you have any good ideas? 25th is the Silver anniversary, we'll be FIREing in a few months and I plan to surprise her with a Silversea cruise in the Spring. That'll be a great way to celebrate retirement, but doesn't really count for the gift I need "now". I can't book it now to hand her the tickets because I'm not sure about the best dates yet. Re: Good Anniversary gift ideas for wives? Tickets for an event (concert/play/...) that you'll enjoy going to together? Our 25th is coming up soon too. I will be getting us an experience. I looked into a hot air balloon ride, but $800! Probably a nice dinner out and a show or similar. We do us anniversaries too! Highlights the fact that we both have to work at it to keep it good. That said, there's nothing quite like a sincere card detailing specific reasons why you appreciate someone. Then again, we're tin or something so...we keep it cheap. Write your wife a letter, long form with penmanship, explaining what first drew you towards her, why you chose her, and why you continue to fall in love with her 25 years later. You can wrap it up in silver paper, or even put it inside a silver frame. I'd give her a silversea brochure if that is the intended gift. We went to one of those paint nites for our last big anniversary. Go to a bar or studio and an instructor walks you through how to do a painting. All supplies are provided. They usually have a bunch of painting to pick from and do one each night. Also did a photo collage of pictures of us from our marriage & dating. Both were fun and different from our normal nights out and gifts and now hang on the wall. Lithium ion powered impact driver. Great for remote location removal of wheels. Wait...you mean TO the wife. Hmmmm.....I got nothing. I'm way beyond 25 years and both she and I are at the point that we have no time and no clue, so we go out the Cheesecake Factory for a dinner and call it good. Definitely swoon! This is a winner and barely costs a $. I like the experience ideas like concerts, the painting night, a hot air balloon ride and I have seen ALL of those options on Groupon and LivingSocial. So if you are leaning in that direction maybe check that out. You could also do a couple's massage or just a massage for her. My husband got me a massage one year as an anniversary gift and it was awesome. Of course that's the best sounding idea, but I'll have to come up with something besides "hormones, booze, and lucky timing"! The good news is hurricane Florence made us decide to postpone the celebration from this weekend to next weekend, so I've got an extra 7 days to think of some sweet things to write, and plan a weekend get away. I'm thinking the Grove Park Inn in Asheville & there's always music, art, food, & beer there. There's a spa at the GPI, so we can get massages too. I guess I'd better get reservations ASAP. I like the hot air ballon ride idea, but seems tricky to plan because the weather needs to be clear and calm. I called Silversea for a brochure, but the guy in Miami said they mail them from Monaco, so it probably won't arrive in time. I might have to print one myself. She really likes champagne, so I might try to find a silver bottle chilling pail and some champange, of course. The date of our anniversary is 9/18, so I'll send flowers to her at work. That should be a nice 25th. Right? You all can keep posting suggestions. I'm sure there are plenty of guys like me that need all the help we can get. I'm like the guy above that mentioned the impact driver. Although she appreciates household tools & appliances, a new vacuum cleaner would not go over very well at all! Unfortunately there is no one-size-fits-all perfect gift (although the letter is an excellent idea). I am a very good gift giver, and think a good gift for someone you have a personal relationship shows that you understand something about what's close their heart and makes them an individual. This is why people joke about vacuums as a gift - it shows a tone deafness to the woman's feelings as most women do not love chores. This is why the letter is a great idea - it is personal and who doesn't like to be told how awesome they are? It's a matter of framing - your hormones, booze, and lucky timing could also be framed as she was beautiful, she was fun, and you felt lucky to have crossed paths with her. ^^ you mean when DH bought me an iron and was surprised that I did not appreciate the gift? "I noticed that you were frustrated when you were ironing last time.... so I bought you a new, better iron so you would find it easier". .... No sh*t sherlock. I was frustrated that you were not ironing your own clothing and I was only doing it because we were going to dinner with my parents..... ! I have a few other gifts from him along these lines, too. What is her love language? That will lead you to a good gift. acts of service - what has she been asking you to do forever - a house project? cleaning up your clutter? Hinting at a new deck or a newly decorated bedroom? For one of my bigger birthdays, I told DH I didn't want to see his clutter in the attic, talk about it every again or have to interact with it at all. All I wanted for my b-day is a giant purge of the attic. It took him hours, but he did it. Physical touch - I'm sure you can figure that out. if it's a surprise, why can't it be the gift? I'd be happy with it......like someone said, wrap up the brochure....although, the love letter idea is pretty awesome. That's a keeper. But I'm a quilter and a good iron is awesome. I don't iron clothes. We don't even have on in the laundry room. I have a "to iron" bag in my closet from when he was in the air force (has a few of my shirts in it too). He seperated in 2006. Even better, get a picture of the cruise ship with the destination in the background. Find a nice pic of you two - maybe a headshot or selfie - and paste it "onto" the boat. It's ok if it's not professional looking - in fact, I prefer it a little campy. Add that to the awesome letter that someone else suggested up-thread. Present it to her with coffee/mimosa/breakfast that you sneakily woke up early to prepare. That's a great idea. It makes the brochure a lot more "real" and binding. 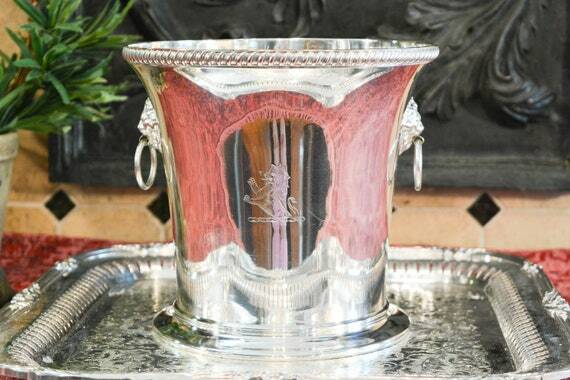 I found a lot of silver ice bucket / wine chillers on Etsy. I contacted the seller of my favorite one to see if she can ship ASAP. It has cool looking cast lions head handles. The Grove Park Inn is $450 per night, so I'll have to find something else in Asheville. I just can't bring myself to blow $1000 on a hotel room for 2 nights. She wouldn't like that either. In my family we often give a model of a present if the present itself can't be opened on the day for some reason. E.g. if I give a pair of shoes, but I need the recipient to try them on, I'll wrap up a pair of doll shoes and them take her shopping later. The brochure with your picture in it is the same idea. You could also print up mock cruise tickets. You could also put together a tote with supplies for the cruise, if there are things your wife will need such as sunblock, foreign currency, a book to read in the deck chair, etc. The ice bucket sounds like a great idea--silver and something she will enjoy using. To me, a cruise plus an ice bucket plus champagne is way more present than anyone needs, so I would not add a weekend away on top of that. The anniversary is now, and the cruise will also be a retirement celebration in the Spring. The past couple of years have been extra stressful, so I'm trying to do more than "enough" to compensate for her patience. The weekend won't be extravagant, but we'll go somewhere. Does she share your mustachian tendencies at all? Because the amount you are spending would give me hives.... I'd be so stressed out if my husband chose to spend so much money without consulting with me. One surprise cruise is nice. That with a silver gift and a weekend away- it's too much. But while your subject line asks for wives in general, your question is just about your wife- so I don't know what she would like best. This is the silver champagne chiller I just ordered. She is frugal, but she thinks 25 years is an achievement and expects to celebrate it. We've lived a frugal lifestyle for 25 years and have finally reached the point where we can spend more. I am so much itching to link you to the "declutter" thread..... but I won't because the sentiment in your gift is there, plus the case of "champagne" that she likes is a great touch. My wife and I were talking about our 25th anniversary this morning on our commute to work. I had looked at a hot air balloon ride ($) a trip to Singapore which we both love ($) or a trip to Tasmania, where we spent our honeymoon ($). She suggested we take our motorbikes and go for a camping holiday for a few days. Her suggestion wins! 1) my 1st husband wrapped up a certificate that said "Redeem for any one pair of shoes that you WANT but DO NOT NEED." I love shoes and was too cheap to take myself shopping. But now I *had* to go shopping because he wanted me to. I had the best time picking them out and every time I wore those pretty little heels (for years, until they fell apart), I thought of him and smiled. Even after our divorce. 2) my 2nd husband bought a bunch of long-stemmed roses, tied a string around each of them with a number tag, and hid them around the house. He gave me a scavenger hunt sheet with descriptions of the places - the descriptions revolved around memories of us. "The place we sit to have serious discussions." (his office chair) "The place we make wonderful family memories" (the dining room table) "The place you run to when we argue" (The bathtub - I scrub things when I'm upset, so we have most of our arguments in the bathroom). I was in tears by the time I got halfway through the list. It was a little overwhelming to see how much of *us* lived in every room of our home. At the last place was a handwritten "I love you"
Do you own your home? A beautiful flowering tree (cherry blossom, magnolia, etc) would be a gift she would enjoy as long as you live there. Personally, I'd love this gift forever (although that love letter idea is pretty heart-melting).